Hope to see everyone tonight at the meeting. 6 pm at our hall. We aren’t quite moved in but soon. Union Meeting January 17th 6pm. January’s Union Meeting will be at Sheet Metal Local 219 next door on Publishers Dr. 6 pm. Same as last month, North Door. Everyone should be receiving a form from Tri-State Welfare Fund. This form is requesting information on whether you have other insurance through your family. This form was sent out to eliminate the denials when your dependents have their first claims of the year. If you recall your dependents were denied until you stated whether there was other coverage for them. Hopefully this will help move your dependents claims through more efficiently. Let me know if you have any questions. 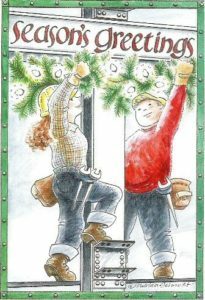 Happy Holidays from Ironworkers Local 498. We hope the Holidays bring you joy and the New Year brings you prosperity! We will have a meeting this month! The December 20th Union Meeting will be held at Sheet Metal Local 219 at 6:00pm. Enter at the North Door. Hope to see everyone there. If you need to pay your dues before the meeting, please do so at the 498 job trailer. who died on Friday, November 11, 2016.
with Father Howard Barch officiating. Memorials may be directed to VNA Hospice. Jack was a member of the death benefit program. Ironworkers Local 498 had a water main break under the floor floor of the building and significantly flooded the building. We are currently working on phones. We are working on a temporary office set up. Dave will still be dispatching at 6 am at the hall. We will still continue to take applications for the apprentice program. His obituary was published in the Rockford Register Star on Sunday. Are you ready to take the challenge of becoming an Iron Worker? Applications will be accepted starting October 31st 8:30am – 1:00pm. See below for information on how to BUILD YOUR FUTURE! !